I am 100% ready for everything Fall. I am ready to eat Fall foods, drink Fall drinks and decorate to the nines. This happens every year, so y’all really should not be surprised! I usually try to wait till September to go 100% Fall, but I am weak this year. It may still be in the 90’s outside here in Florida, but in my house it’s a crisp 74 degrees and I have all my pumpkin candles burning. I figured a good way to start my Fall kickoff would be with breakfast and these Gluten Free Apple Pie Pancakes absolutely hit the mark! So dang good! 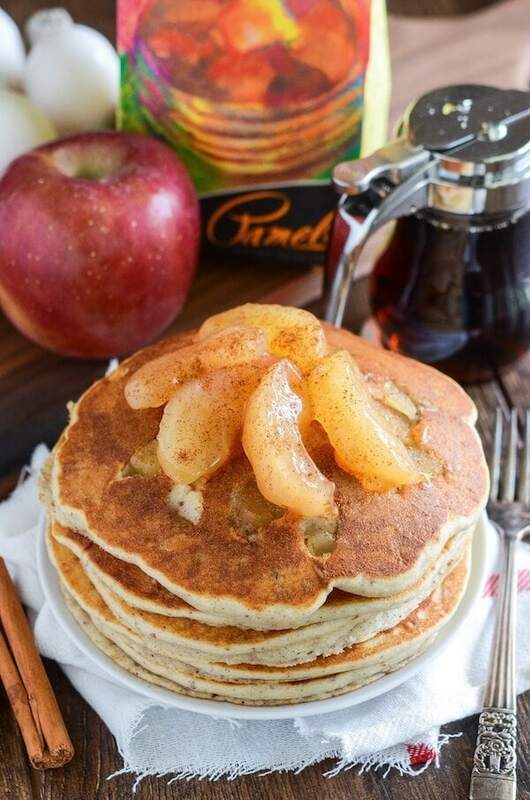 Look at those apple slices and maple syrup drizzle — y’all these pancakes are amazing and super simple to make with the use of Pamela’s Baking & Pancake Mix. This is my second recipe featuring Pamela’s Baking Mixes (the first being these amazing Cherry Almond Bars) and I am even more in love with their mixes. 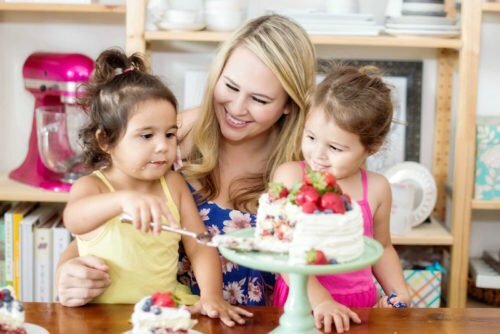 A little while ago we got a new babysitter and it turns out she is Gluten Free. The timing could not have worked out more perfectly. It has been so great to be able to discuss recipes and test them out with her. These pancakes were a big hit and you really can not tell they are any different than non gluten free pancakes. The girls gobbled them up just like any other pancake they have come across…and so did Jorge and I! These Apple Pie Pancakes are filled with chopped up bites of warm apples and my favorite spices — cinnamon and nutmeg. 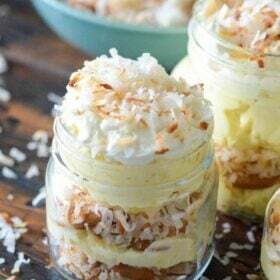 I topped them with extra apples, whipped cream and maple syrup. 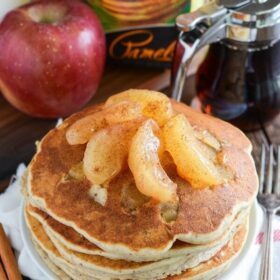 You definitely don’t need anything special to make these pancakes, but with the apple filling, a thin spatula is a big help. I have this spatula and it is great for pancakes. It is really thin and long so you can get the spatula fully under the pancake when you flip it. I hope you enjoy these Gluten Free Apple Pie Pancakes as much as we did! Lyla was really sick over the weekend and we ended up having our first middle of the night ER trip with a toddler. Thankfully she’s doing much better now and Ellie did not catch her virus. Sunday morning was the first day Lyla was feeling good enough to eat, so I made another batch of these pancakes for her as a special treat. She gobbled two of them up! In a large bowl, whisk together Pamela’s Baking & Pancake Mix, cinnamon, nutmeg, eggs, milk and vegetable oil. Pour 1/2 cup of batter onto heated griddle. Immediately sprinkle about 2 tablespoons of chopped apples spread out on top of the batter. Once little bubbles have started popping up, carefully flip pancake and cook through. Continue process with all pancake batter. Serve warm topped with leftover chopped apple pie filling, whipped cream and syrup. This post is sponsored by Pamela’s Products. All opinions are, as always, 100% my own. Thank you for supporting the brands that I love and that help keep The Novice Chef running! I’m SO ready for fall too!! 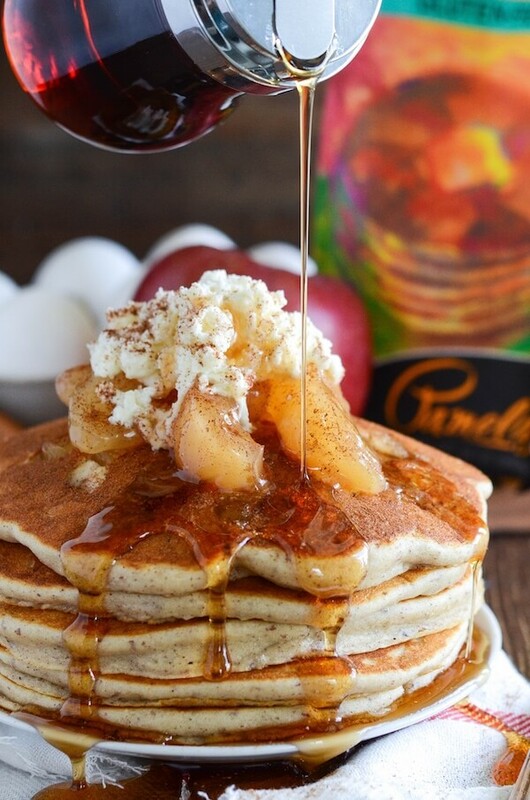 Apple pie pancakes are on my list to make!! Hurry up and get here NOW, Fall!! Apple pie is one of my favorite things in the world, so I HAVE to make these!! These pancakes definitely scream fall breakfast! Me too! Fall all the things! These pancakes seriously look amazing! 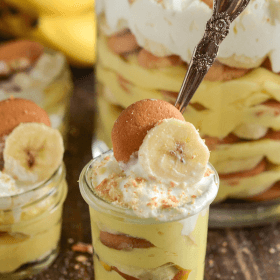 I love everything about these pancakes – yum! 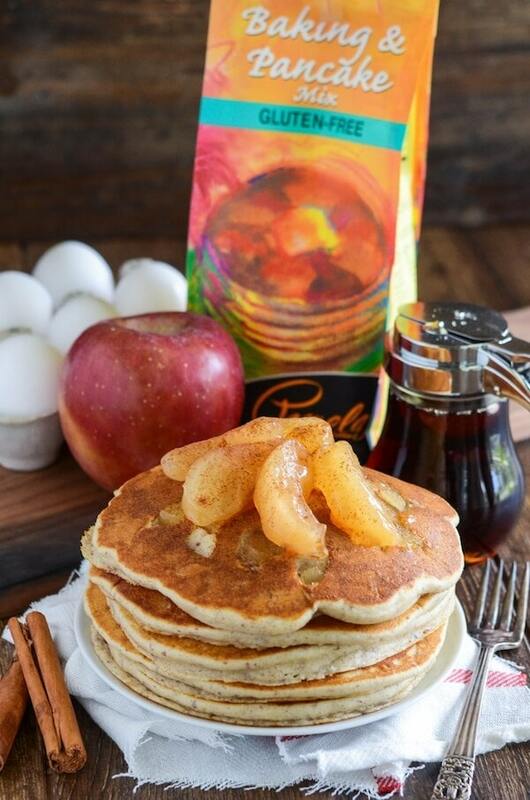 I love using Pamela’s mixes and these pancakes are perfection! I love anything apple pie flavored and will be adding these to my breakfast menu soon. I love that you started fall early. Especially with this dreadful Alabama summer I need it! And these pancakes!! 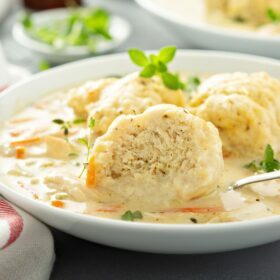 Oh, those look sooooooo good! I have missed apple pancakes going gluten-free (for celiac) last fall. I’m excited to try making them again!!! 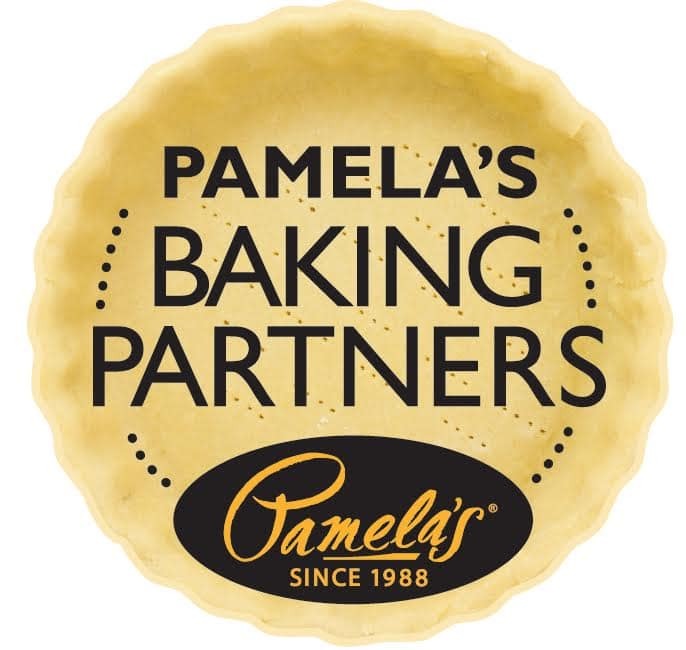 Pamela’s is one of the better pre-made flour blends we’ve tried. I will never say no to pancakes, especially when apple pie flavors are involved! Love these for fall. 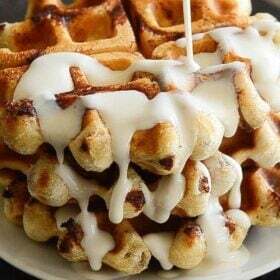 We used Pamela’s for waffles this morning! What a perfect way to start the day! It’s still in the 90s here, but I am sooo ready for all the Fall flavors! Oh yeah, I’m ready for apple season. 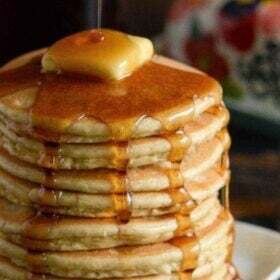 These pancakes are perfect! Good one. i prefer to eat Apple pie pancake over creamy cake. Mouth watering pictures. Thanks for sharing, …looks delicious!! Me too! Fall all the things…. Que delicia, chega deu água na boca. 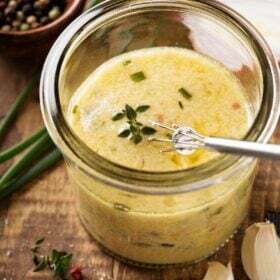 Going to be trying this recipe today. Can’t wait!